Join The Chinatown Experience Tour to learn more about Chinese food, fun, fables and visit a grocery store to find key ingredients for this and other authentic Chinese dishes. So simple, so good. Once you make this DIY Chinese Five Spice Powder, you'll never go back to store bought again. In Chinese food this is widely used to season meats or vegetables. More so in the mainland, than Hong Kong where the emphasis is more on simple and fresh, rather than complex and layered. Sichuan pepper - actually prickly ash, a member of the citrus family these are always toasted and ground. Careful cooks discard the black seeds that pop out when they're tossed in a dry hot pan. Fennel, Cinnamon, Clove, and Star Anise. It goes really well with lamb. These five combine to make a warming and slightly sweet spice blend. It will add depth and fullness to a simple stir fry. Try adding it to your next pork roast or make a paste with it and neutral oil for an amazing roast chicken. Some variations include the addition of Nutmeg, White Pepper, Ground Ginger, or Cassia in place of Cinnamon. In Japanese food we use Shichimi which has sansho (our name for prickly ash) and yuzu. 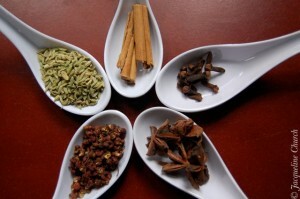 In Indian cuisine you might add cumin or cardamom and produce a garam masala. Measure ingredients to start. You'll adjust as you see fit. Place a dry pan over medium high heat, place spices in pan, breaking up cinnamon and star anise. When the spices get warmed up, you'll be drawn over the pan, inhaling the scent. Notice little black seeds coming out of the Sichuan pepper, the fennel starting to darken? Take the pan off the heat and pour the spices onto a plate to cool. Once cooled, place in spice grinder and buzz it up. Tip: I use a coffee bean grinder, designated just for spices. To clean out the spices and start fresh, tear a hunk of soft bread and buzz it up. It will absorb the spices. You can also use a damp paper towel or silicone basting brush. BE SURE TO UNPLUG IT before putting your fingers in there. Trust me on that one. Make a big batch and bottle in cute little jars as a holiday gift.